Most toy drones come with a couple of spare propellers to get you flying again after a crash. But with Flybrix, even after a catastrophic collision with the ground, you can rebuild and get airborne again within minutes since the drone is mostly made from Lego. Flybrix aren’t officially affiliated with Lego, but they are completely compatible with the world’s most popular building toy. Which means that in addition to the small collection of Lego parts that ships with each kit, you can completely customize your craft using the Lego you already have at home. You can even increase the number of motors, from four, to six, to eight, to increase your custom drone’s lift capabilities. The Flybrix kits, available starting today at an introductory price of $149 for a basic kit, and $189 for a deluxe, come with propellers and motors, custom boom-arm bricks allowing them to be attached to your own creations, a pre-programmed Arduino-compatible flight control circuit board, and all the cables you’ll need to wire things up. If you plug in your smartphone to charge it, you can easily put one of these kits together. 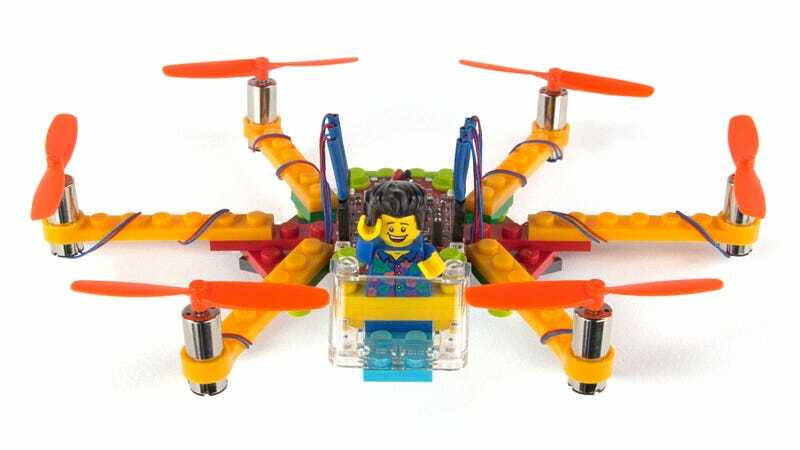 Piloting your Lego drone can be done using a mobile device’s touchscreen through the free accompanying Flybrix iOS and Android apps. Or you can opt for the aforementioned ‘deluxe’ version which includes a physical RC controller which makes it a little easier for amateurs to fly—without crashing. But this might be the one drone toy you’ll actually look forward to crashing, since it means you get to design and build a whole new craft, and play with Lego.